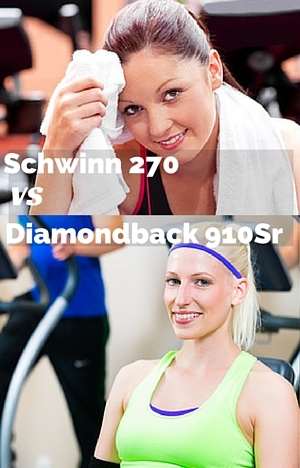 In this Schwinn 270 vs Diamondback 910Sr comparison they go up against each other. They’re compared side by side. To show the differences between them. And, to help you decide between the two. It shows up the differences. And there can be a big difference in price to justify. By looking at the differences it’s possible to see what you get for the price. There are similarities as you’d expect but I think they don’t really help in deciding between the two. But before we move on to the differences and the detailed comparison here is a quick review of each of the two bikes. This popular bike has a high rating from customers. The rating starts with it being easy to assemble. But there is more to it than that. The magnetic resistance has 25 levels with smooth transition between them. It works with the inertia flywheel and belt drive for an almost noiseless operation without choppiness in the pedaling motion. It also means there is little maintenance required. The range of resistance levels means the bike is able to be used by beginners as well as more advance athletes looking for challenging hill type workouts. The 29 programs provide plenty of variety and help in achieving their fitness goals. It can also help with keeping you interested. It works with the Schwinn Fitness account and myfitnesspal.com so you can track and analyze workouts. Customers like the comfortable quiet smooth ride, the easy seat adjustment and the easy to read display. Read my full review here. This bike has certainly stood the test of time with it being a consistent seller for a number of years. It has an easy to adjust seat and backrest height to provide the best fit for workouts and provide good support for the back. It has 35 levels of magnetic resistance for incremental and smooth transitions between levels. it works with the flywheel so that is operates quietly and the pedaling motion is very low impact through the resistance levels. It is gentle on your leg and hip joints. The range of resistance also allows this bike to be used by beginners and advanced exercisers. The 32 programs plus heart rate control programs give you a good choice of programs to help with motivation and achieve your fitness goals. Seat Adjustment. They have similar methods of seat adjustment using a lever under the seat to unlock and lock the seat in position. The difference is that the Schwinn 270 manual recommends you make the seat adjustment while off the seat whereas the 910Sr you can do this while in the seat. Backrest Material. The 910Sr has a mesh backrest with Schwinn 270 having a plastic vented one. There doesn’t seem to be a preference expressed by people who’ve used them bikes over a period of time in terms of comfort and support between the two but you’d expect better comfort from the mesh one. Backrest Adjustment. The 910Sr has 3 different heights for the backrest which gives you the opportunity to adjust it for your height to give you good chance for good support for your lower back. The Schwinn 270 backrest height can’t be adjusted. Accessories. There is a good range of accessories for both bikes with the Diamondback 910Sr having a docking station for older ipads (1 and 2) being the main difference. Media Bay. The positioning of where you place your media devices is better on the Diamondback 910Sr with it being above the bike so it doesn’t end up covering the display of your progress. The Schwinn 270 has 2 displays and when you put your media device it covers up the upper display so you can see a dot matrix display of your progress but you still can see numerical measures in the lower display. Fitness Account. The 270 gives you the ability to upload your account to a free Schwinn Fitness account and myfitnesspal.com to be able to track and keep a record of your workouts on the bike. It’s not automatic you have to do this via USB stick, but with the 910Sr you need to do it all manually. Weight. The Diamondback 910Sr is a much heavier bike at 152 lbs with the Schwinn 270 weighing in at just 86.6 lbs, making it a much more solid bike. However, the 270 overall is seen as a good sturdy bike by customers. Both bikes have transport wheels so moving them around is much the same but you do need to take a little more care with the Diamondback due to its extra weight – but it is possible for one person to move the bike unless moving it up or down stairs. Dimensions. The Schwinn 270 needs a bit more room to use and store it with it being 4 inches wider. User Weight The Diamondback 910Sr is designed for people up to 325 lbs with the 270 going up to 300 lbs. Resistance Levels. Although there may be some difference in the range of resistance between the bikes. The difference between the two is more to do with the increments between the levels. Both go up incrementally but with the Diamondback 910Sr you should notice a slightly smaller transition between each of the intervals. User Profiles. The Schwinn 270 allows you to set up to 4 user profiles to help with better tracking and personalized measures for 4 people. The Diamondback 910Sr gives you 2 user profiles plus a guest profile for when you have someone who doesn’t normally use the bike – it allows them to get on quick without having to set up their full profile. Pre-set Programs. The Diamondback 910Sr has a bigger range of pre-set profile programs and heart rate control programs to provide you with much more variety. The Diamondback 910Sr has 35 profile programs plus 6 heart rate control programs and fitness test. The Schwinn 270 has a total of 29 programs including profile, heart rate control and fitness tests. The Schwinn 270 is $340 to $450 cheaper than the Diamondback 910Sr depending on deals . Looking at these two bikes I’d go for the one that is the cheaper of the two – the Schwinn 270 – you get plenty of pre-set programs included . I also like that you easier track your workouts with the free fitness account. I like to look at my numbers. It is well regarded by customers who say they get a good low impact workout from it. If you are looking for a bike that is made for people over 300 lbs and below 325 lbs then the Diamondback 910Sr is the bike to choose as the Schwinn 270 is made for people up to 300 lbs. Its other advantage is the adjustable height of the backrest which can allow you to get better support for the lower back – although people on the Schwinn 270 say they can help to solve this by using a towel and/or a folded up towel. The detailed table below lists the bikes features, specifications and dimensions line by line so you can see how they compare in detail – the differences and similarities are all there. I hope you know have the information and have been able to reach a decision as to the bike you want to buy. It would be great to hear your thinking on this.